1.Exchange your bells for new keys and resources on the FIRST and SECOND DAY of the carnival! 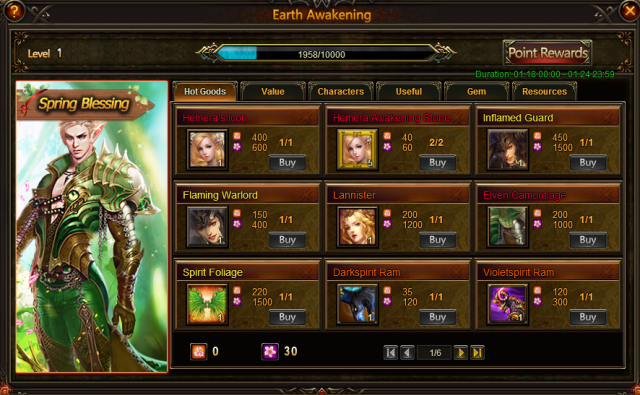 2.You can get Peach Blossom and Lush Peach Blossom in Elemental Zone instead of Gemology. 3.There will be Time-limited resources on sale from Jan. 20 to Jan 23(server time)! 4.New slyph Lannister and Ocarina, plus new hero Inflamed Guard will also show up there. Wanna dress up a new clothing? Elven Camouflage and Imperial Celebrity can be your choice! This is icon. Ready? 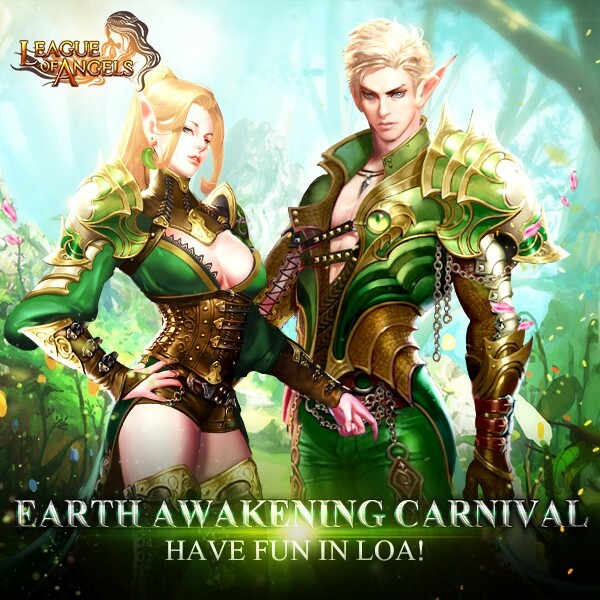 Click - Let's enjoy the Earth Awakening Carnival! Click the icon of Christmas Holiday, and you will see four parts. They are New Force, World Boss, Earth's Gift, Spring Blessing. Fight together and get great rewards here! Click New Force you will see this panel. When the EXP reaches certain amount, all players in this server can collect the rewards. 1. 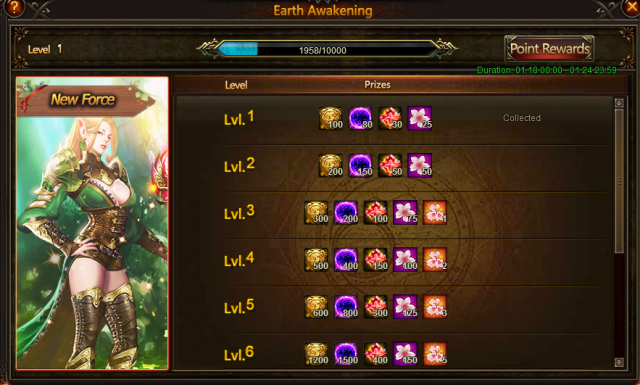 Earth Awakening consists of 4 parts: New Force, World Boss, Earth's Gift, Spring Blessing. 2. Every Peach Blossom acquired will earn a player 1 personal point and increase the Christmas Spirit's EXP by 1. Every Lush Peach Blossom acquired will earn a player 2 personal points and increase the New Force's EXP by 2. 3. All New Force's level rewards can be collected once daily when available. 4. 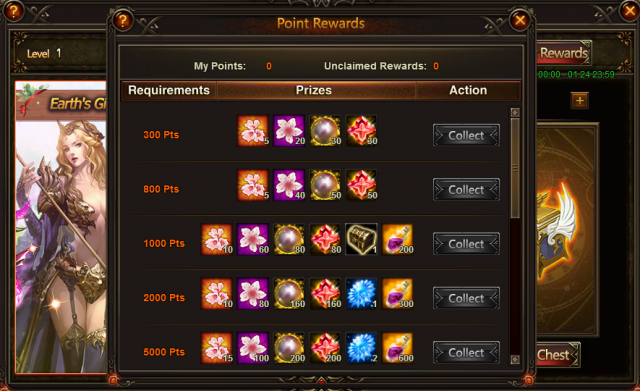 Join the World Boss during the event for a chance to receive Peach Blossom. Resources, Peach Blossom, Lush Peach Blossom and more are waiting for you in Gift Boxes! You can randomly get one of the following items with different kind of Corns. Good luck! There are 3 kinds of gift boxes. You need to collect stockings to open them. You can get Young Seedlings, Growing Seedlings and Healthy Seedlings through Hot Events or use diamonds to buy. You may ask, how to deal with the Peach Blossoms I have got? OK, here comes a chance for you to exchange great items with Peach Blossom and Lush Peach Blossom! 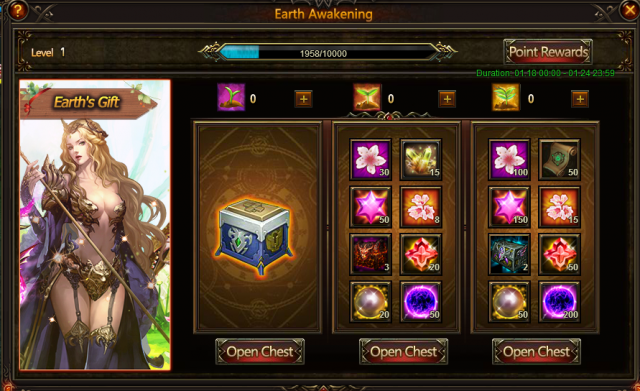 In Spring Blessing, Parchment Chest(Uncommon) and Magic Dust Chest(Uncommon) will be available! New slyph Lannister and Ocarina, plus new hero Inflamed Guard will also show up there. Wanna dress up a new clothing? Elven Camouflage, which is the costume on the interface, can probably be yours! And Hemera, Hemera Awakening Stone, Isolde, Isolde Awakening Stone, Spirit Foliage, Darkspirit Ram and Violetspirit Ram will also be there. Mount Fiery Bull, Persian Cat, Phoenix, Jade Dragon, Armored Elephant, Armored Rhino, Scarlet Finch, Inferno Steed; Fairy Golden Hamster, Little Bat, Silver Lord and many more other items, are all available! Purgatory Wand Chest (Epic), Rowan Chest (Epic), Skill Book-Pristine Sprit,Glacial Heart, Stormy Heart, Lvl.10 PATK+CRIT Damage Gem, Lvl.10 MATK+CRIT Damage Gem, new fusion gems with three attributes and more resources will be available! Description: Complete the tasks to get more Peach Blossom here! Enjoy! More exciting events are coming up through Jan 18 to Jan 24(server time), check them out in the in-game Hot Events now!